If you live in any of the urban areas of Texas, you’ve probably seen large colonies of the green and gray colored bird known as the monk parakeet. You might think they are native to Texas, but they’re not. And they were escaped birds that have done very well. But what’s very neat, is if you go a little farther south into the Rio Grande Valley, we have a native parrot, that’s green and has a little red on the forehead, called the red-crowned parrot. Cliff Shackelford is a non-game ornithologist with Texas Parks and Wildlife. And that bird [the red-crowned parrot] is a native species with a very small global range that is from south Texas all the way to parts of northeast Mexico. 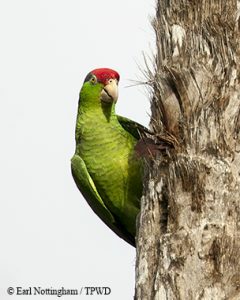 Cliff says you’ll find the native red-crowned parrot in the Rio Grande Valley. And they may be closer than you think. They’re highly urbanized. That’s where a lot of the green space is. A lot of the fruit that they’re eating in backyards. Seed feeders and so forth. They’re really thriving well in south Texas. Tomorrow: This charismatic native parrot and its tendency to dine and nest in the backyards of Rio Grande Valley residents. Meanwhile, discover the unique wildlife and habitat of Texas with our nine interactive Great Wildlife Trail Maps! Find them on the Texas Parks and Wildlife website. This entry was posted on Wednesday, June 27th, 2018 at 12:00 am	and is filed under Birding, Red-Crowned Parrot. You can follow any responses to this entry through the RSS 2.0 feed. You can skip to the end and leave a response. Pinging is currently not allowed.